Just a sneak peek! Send out some already. The rest are almost done! Love the Christmas Deer and my all-time favorite Lovely As A Tree. 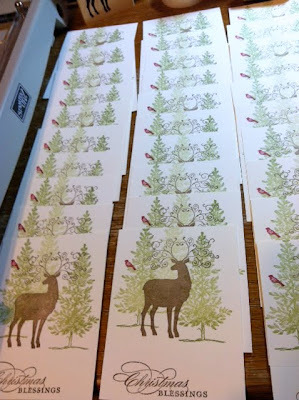 Hopefully I can get them finished tonight and send this little guy off to customers, family and friends! If you are on my list...Warning...you will get "glittered" so enjoy! 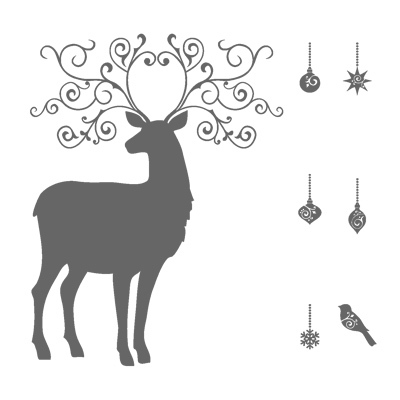 Elegant seven-piece set features the silhouette of a fantastically imagined deer with ornate antlers, winsome bird and delicate ornaments. Ultrafine polyester Glitter adds a touch of sparkle to your stamped images. It’s easy to use and some shimmer to any project! Gwen - Those are beautiful. You are so stinkin' talented! Glad you're my friend!